Glad you found us. Please take a few minutes to visit our site and learn what we can offer. San Juan Marine Freight provides a variety of marine transportation services, including vehicle, equipment, deck loaded freight, construction support, filming platform,aircraft salvage, dive support, fireworks platform and more. The M/V San Juan Enterprise is based in Anacortes, Washington, known as the “Gateway To The San Juans”, and serves that area along with the greater Puget Sound region. 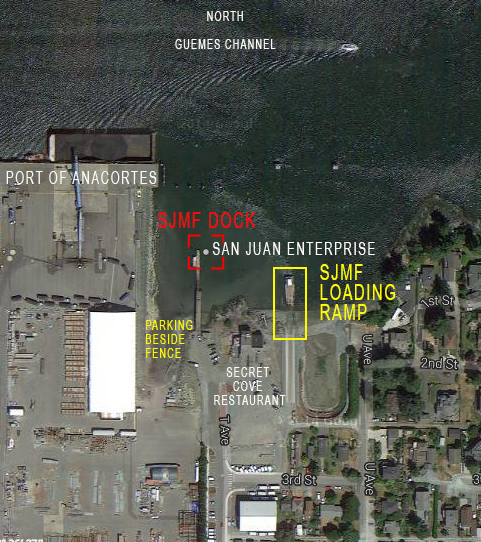 Find our loading ramp downtown Anacortes at the North end of T Avenue on the Guemes Channel in Old town Anacortes on the waterfront, just to the east of Dakota Creek Shipyard. Free parking is available beside the fence near our dock. The loading ramp is to the right or East of Secret Cove Restaurant. Waiting for your delivery? Visit this link www.marinetraffic.com/en/ais/home/centerx:-122.6/centery:48.5/zoom:16 to locate the Enterprise while under way to estimate its time of arrival. This sample page shows what you see at Vessel Finder. You can track this vessel to your destination while underway in live time.